Sweet Potato Jalapeno Poppers are an insanely simple appetizer and also insanely delicious. Make them ahead for a party or to pop in the broiler for an afternoon snack. The ingredients for our Crazy Ingredient Challenge this month were Sweet Potatoes and Jalapenos. So many possibilities raced through my mind. But, I know this time of year many people are looking for a quick and easy appetizer for their holiday gatherings. 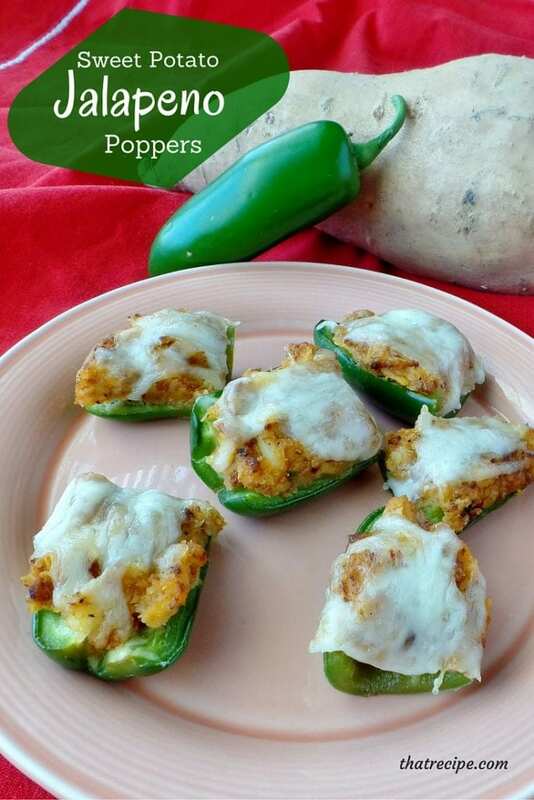 So I finally settled on these Sweet Potato Jalapeno Poppers. The Crazy Ingredient Challenge is a group of bloggers that choose two ingredients every month and then create a recipe with them and post about their recipe. Be sure to scroll all the way to the bottom to see what the others created. I wanted to keep these simple because I was feeling lazy realized everyone is looking for easy this time of year so I kept it to four ingredients: jalapenos and sweet potatoes, of course, as well as sausage and cheese. You can partially bake them ahead of time, freeze them and then top with cheese and finish baking immediately before serving. The recipe below is an approximation on the amounts. Use what you have on hand and adjust to your tastes. The peppers and chorizo provide plenty of flavor, but they don’t make it too hot. The sweet potatoes and cheese balance it out nightly. Peel sweet potato and cut into 1 inch cubes. Put in a medium sauce pan, cover with water and cook until fork tender (approximately 10 minutes). Drain water and mash potatoes. While potatoes are cooking, brown the sausage. Combine potatoes, sausage and 3/4 of the cheese. Cut peppers in half lengthwise and remove seeds (wear gloves!). Stuff the filling in the peppers, place on a baking sheet. Top with remaining cheese. Bake at 375 degrees for 20 minutes. Turn oven to broil for the last few minutes if you want a crispy cheese topping. I never thought to STUFF the jalapenos! I love your take on the challenge. I have to make these on game day. I only thought if it because I had some great poppers at a Halloween party and then the next day I saw the ingredients chosen. Oh I love poppers and these are making my mouth water. Great idea! Thanks, Wendy. I am surprised I was the only one to come up with it. Thanks, Jamie. They were quite tasty. 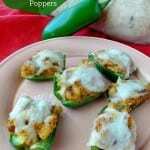 I had never tried jalapeno poppers until a Halloween party, I am now hooked. I toyed with this idea, too. Love that you added chorizo! I was surprised no one else made it for the challenge, it seemed like an obvious choice to me. Until I saw what everyone else made. These are so great. I am pinning them for later use. Going to a holiday party next weekend, I may just bring these! Thanks for sharing. Always great co-hosting #HomeMattersParty with you! If you do make them, let me know how they went over.